We were recently surprises when Jeff Jassby of Diamondhead, MS. showed up at GCO's boat rally this year with his brand new 43" Nortech named X-cess Wetness. The boat won Best Interior at our rally. Jeff gave us the tour, and it was like taking a walk through a suite at a Vegas casino. Everything from AC, to a 20 inch Plasma TV screen. Photos show the wet bar, the wash room, over 6 foot head room, and full entertainment electronics and lighting. Topside you find the console with a pair of right side bolsters with a unique back to back bench seat behind them. And of course the usual forward facing rear bench seat. 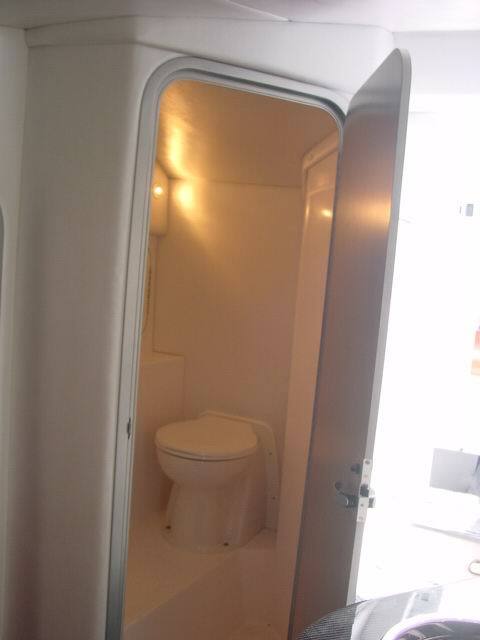 On the left gunnel you will find sound, storage and enough drink holders for the entire crew. Intergraded in to the design are strategically places step pads to assist riders in getting up to dock side or to the bow. Note the center mounted steps in the dash to aid in getting over the wind screen and on to the front deck at mooring time. The power was done by Total Marine & Performance of Slidell, LA. Two 750's engines , #5 Drives with Stelling Extension Boxes and Merc. 5 blade props. On the swim platform it states, "The Wetter The Better" and we would have to agree. Two thumbs up to Jeff and Sandy.